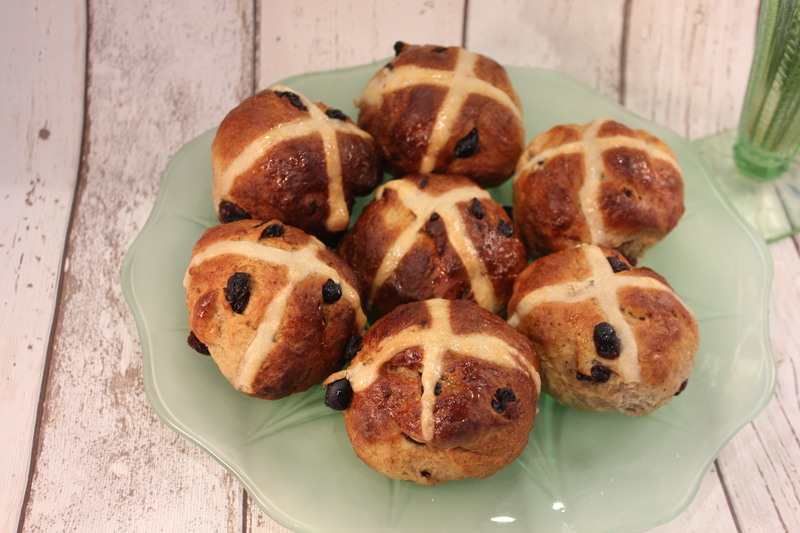 I both love and hate Hot Crossed Buns; I love the smell of them baking, the scent of which generally wafts through any supermarket from mid-February onwards, but sometimes I get a nasty surprise when I indulge in one. Currents! I hate them. Nasty little things! Thankfully, I have had the opportunity to revise recipe to include sticky, delicious California Raisins in place of the traditional beasts. The perfect partner is a good helping of Cinnamon in the mix, a little patience in the bake, and a serious helping of butter to serve. Combine flour, raisins, sugar, yeast, cinnamon, and salt in a large bowl, mixing well to combine. Make a well in the centre of your dry ingredients and add chopped soft butter, beaten egg, and warm milk. The milk should feel warm to the touch but not piping hot. If it is too hot, it will kill the yeast. Make your hand into a claw shape and start to work the dry ingredients from the edge of the bowl into the wet ingredients. Once all have combined into a lump of dough, turn out onto a work surface and knead for around a minute. Return the dough to the mixing bowl, cover with clingfilm, and leave to prove in a warm room for 2 hours or until doubled in size. Once doubled, turn your dough out onto a worksurface and knead briefly to knock out the air. 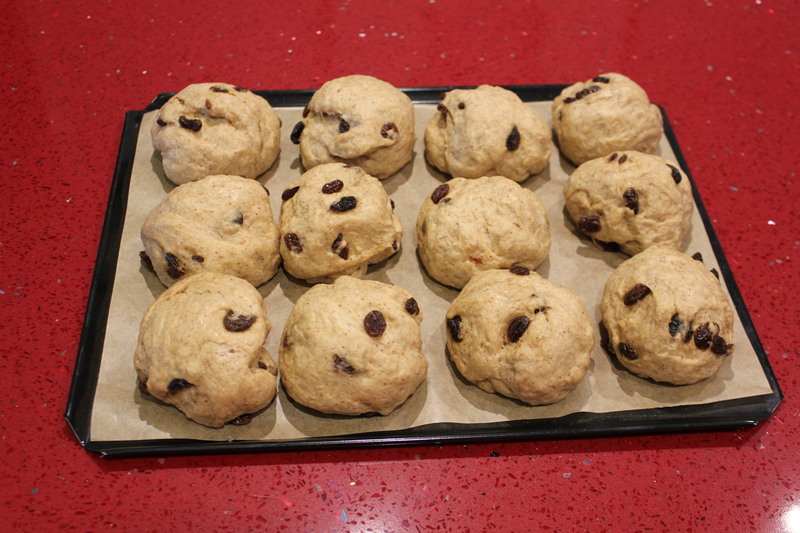 Divide into 12 equal balls – rolling in your hands to form them – and set on a baking sheet lined with greaseproof paper. Cover in clingfilm and leave to prove once more until doubled in size. This will take 45 minutes to 1 hour. 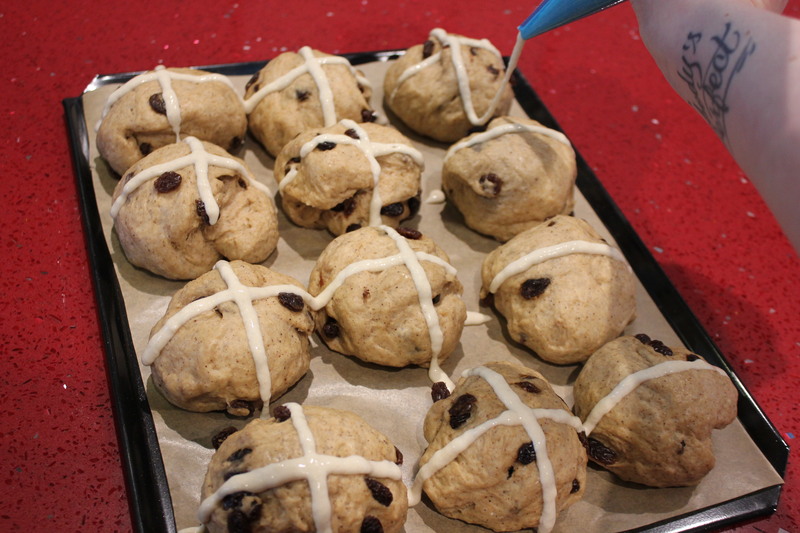 Once doubled, cross with a paste made from 3tbsp flour and 3tbsp water. Spoon this into a piping bag and pipe long lines across the whole batch of buns to make your crosses. Bake in a pre-heated oven for 12-15 minutes until golden brown. The smells filling your home will be nothing short of heavenly. While the buns are baking, prepare a simple sugar syrup by dissolving 2tbsp caster sugar in 4tbsp water and heating gently until the solution is clear. Brush this syrup liberally over the buns as soon as they come out of the oven. Serve warm, or toasted, with lashings of butter and a cup of tea! Feel infinitely smug in the knowledge that raisins are one of your 5-a-day.